Florence was founded in the mid-1850s as a crossroads depot for three rail lines competing to provide service to the Pee Dee region, the northeastern area of the state through which the Great Pee Dee River runs. Named for the daughter of the president of the Northeast Railroad Company, Florence was laid out between 1858 and 1860. Rebounding quickly from the devastation of the Civil War, Florence was home to approximately 700 residents by 1870, more than half of whom were railroad employees and their families. Four years after the war, the number of merchants doubled with the opening of nine new stores. Jews were among the earliest merchants and businessmen in the village, which incorporated in 1871. They formed the base of a community that lasts today. Many of Florence's early Jews were actively involved in politics and civic affairs. Moritz Jacobi, originally of Denmark, came to Florence in 1857 and established a hotel called the Jacobi House. According to the Florence Daily Times, I. Goldstein, who died in 1895, was, “one of the oldest settlers of Florence.” Goldstein had come from Prussia and lived in New York until he moved to Florence in the late 1870s to open a retail grocery store. Abram Weinberg, who served as a warden, or councilman, moved to Florence from Charleston in 1871 to set up a general merchandise store. John Kuker, a German native and pharmacist, opened a store in 1866 and served as a warden, as well as Florence’s second intendant, or mayor. Another German, David Sternberger, arrived in Florence in 1872 and established a retail store. Sternberger and a jeweler, Issac Sulzbacher, joined other community leaders in advancing the case for the creation of Florence County. In 1888, Florence became the seat of the newly formed Florence County, drawn from Darlington County’s southern reaches. Even in the surrounding small towns, Jews played key roles in government. In the early 20th century, Henry Nachman was elected mayor of Lake City. When he reminded the residents that he could not serve in the position since he was not a citizen, the town council passed an ordinance eliminating the requirement. 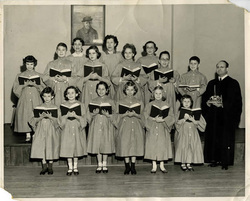 Rabbi Grossfield with Beth Israel's youth choir, 1956. In 1887, Florence Jews founded the town’s first Jewish organization, the Florence Hebrew Benevolent Association. In addition to brotherhood and charity, the group’s objective was to obtain a “suitable burying ground.” Later that same year, David Sternberger, J. DeJongh, S. Elias, and Harris Joseph filed for incorporation of their “charitable and religious association.” Shares were distributed to the filers and to Fannie Nachman, E. Salmonsen, A. W. Lyons, and A. A. Cohen. Plans were made to notify Jews in the surrounding towns of the new organization. By November 1887, the society had purchased land for $50 from the Northeast Railroad Company and a burial had taken place—six year-old Rebecca Sternberger of Darlington, daughter of Herman, David Sternberger’s brother. Seven years later, Herman suffered another grievous loss. His wife and their baby died in Clio and were buried in the Florence Jewish Cemetery. In 1889, the Florence Hebrew Benevolent Association hosted a night of “theatrical entertainment,” raising $98 to cover the cost of fencing in the cemetery. That same year, A. A. Cohen proposed they start a Sunday school, but it is unclear if they followed through with his suggestion. In prior years, Cohen’s daughters had attended Sunday school in Darlington, a nearby community with more than 50 Jewish residents. Over the course of the next three decades, Jewish residents from Florence and surrounding towns such as Darlington, Dillon, Marion, and Little Rock, buried their loved ones at the Florence Jewish Cemetery. Family names included Blum, DeJongh, Fass, Goldstein, Goodstein, Hart, Hartz, Iseman, Rosenburg, Salmonsen, Schafer, Smith, Weinstein, and Witcover. Jewish immigrants from Eastern Europe began settling in Florence around the turn of the 20th century. Charles Insel left Poland for the United States in the 1890s as a young boy. The peddler moved south from New York in the early 1900s in search of opportunity. He married a woman from Allendale, South Carolina, and partnered in a men’s shop with another Jew by the name of Silverman. The partnership did not last and Charles’ business, a men’s shop, did not thrive. Competition from Stein’s may have been a contributing factor. A branch of the high-end men’s store based in Fayetteville, North Carolina, operated in Florence under the direction of Isadore Stein who, at some point, hired Charles to work for him. Other Eastern European immigrants found great success in Florence. Russian-born Louis Greenberg made his way south from Philadelphia in 1910 and found Florence to be a prime spot for establishing a dry goods store. He started by peddling out of his horse and cart. His wife, still in Philadelphia, kept him stocked up by shipping goods to him on the train. According to the family history, when Louis arrived in Florence, there were about half a dozen Jewish families living there, all in business of some sort, including a hotel and a women’s ready-to-wear clothing store. Louis opened his own store eventually and captured the market on furs and hides, becoming the only fur merchant in the Pee Dee region. He successfully expanded his enterprise during World War I to include scrap metal. Greenberg, who owned a Torah and had had some rabbinical training, was instrumental in organizing Orthodox religious services in Florence. He became the lay leader at services held in various rented rooms in town. Keeping kosher at this time was difficult with no kosher butcher shop in town and no refrigeration. Louis, however, was skilled in properly killing chickens and did so for his family. By September 1912, the small group of Orthodox Jews in Florence had incorporated, officially establishing the Beth Israel Congregation. The trustees were B. Patz, M. Rosenfeld, and I. Silverman. They hired a rabbi from Charleston to come to Florence to conduct services. With only about two to three dozen Jews in Florence, the community could not support two different congregations. By 1922, the Hebrew Benevolent Association and the Beth Israel Congregation had merged after reaching a compromise whereby Sabbath services and the Sunday school would follow the Reform tradition, while the High Holidays would follow the Orthodox tradition. Louis Greenberg hosted the High Holiday services in his home, and served as lay leader. The congregation hired Reform Rabbi Jacob Raisin of Charleston’s Kahal Kadosh Beth Elohim to lead Sabbath services. Raisin made the train trip to Florence one Sunday a month for almost a quarter of a century. He had started making this trip in 1919 to serve Darlington’s congregation. By 1922, he was splitting the day between the two communities. The Beth Israel Ladies Aid Society was founded by 13 members in 1922. They managed the Sunday school, contributed to charitable causes in Florence, and were affiliated with the National Federation of Temple Sisterhoods. In 1928, they changed their name to the Beth Israel Sisterhood. Plans to build a synagogue in 1927 were delayed, so the group met in a variety of buildings until 1949, when Temple Beth Israel was built on land donated by congregation member Dr. Michael M. Morse, a pharmacist. Three men were key organizers of the building project. In the years immediately following World War II, Morse, Dr. S. Abe Greenberg, and Isadore Stein approached their fellow Jews in Florence and the nearby towns of Darlington, Hartsville, Marion, and Timmonsville to gain support for the effort. Rabbi Philip Frankel of Charlotte led the dedication service in September 1949. After Rabbi Raisin’s death in 1946, the congregation was served by rabbis from Columbia, Sumter, and Charlotte, North Carolina. At the time the synagogue was built, Beth Israel was home to about 25 member families. The city of Florence grew after World War II through annexation and the arrival of large manufacturing companies. By the 1960s, Florence was home to Francis Marion University and the Florence-Darlington Technical Educational Center. The growth of tourism and the development of cultural pursuits added to the city’s appeal, and in 1965 Florence was named an “All-America City” by Look magazine. By the 1990s, the city boasted two major medical centers, the Carolinas Hospital System and McLeod Regional Medical Center. Jewish population growth paralleled the increase in the general population. As late as 1937, only 48 Jews lived in Florence. By 1960, the Jewish community of Florence numbered an estimated 160, and grew to 285 over the next eight years. In 1984, about 350 Jews lived in the growing city. Once mostly merchants, many of the area’s Jews were now professionals, such as dentists, doctors, and lawyers. This population growth bolstered Beth Israel. In 1952, the congregation hired its first full-time rabbi, Tibor Fabian, who led weekly services and headed the Sunday school. Fabian was followed by Morris Clarke in 1953, who added a new dimension to the services by including music, performed by a newly organized choir. Rabbi Avery Jonah Grossfield served the congregation from 1954 to 1958. During his short tenure, Rabbi Grossfield instituted a number of changes, including adult education, Hebrew instruction as part of the Sunday school curriculum, and the bar mitzvah. His wife Harriet taught in the Sunday school and organized the Beth Israel youth choir. While this effort was a success, the Hebrew classes offered by Rabbi Grossfield were discontinued due to lack of interest. At this time, one family was keeping kosher, obtaining their meat from either Charleston or Columbia. When Rabbi Grossfield left, the congregation relied on two student rabbis who traveled to Florence from New York on the weekends to provide services and Sunday school leadership. They were also served by a circuit-riding rabbi who visited small congregations in the Carolinas. From 1961 to 1970, Rabbi Charles B. Lesser led Beth Israel. In the late 1960s, the congregation purchased two houses adjacent to the synagogue and demolished both in order to construct a new building on the property. 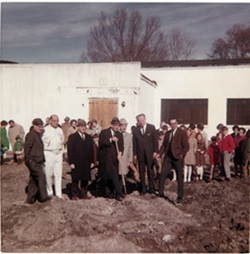 A ground-breaking ceremony was held in the spring of 1969; a year later, a new addition with classrooms, a social hall, and a kitchen was completed. The dedication service was conducted by Rabbi Howard Folb, who had just been hired. By 1970, Beth Israel’s membership consisted of 70 families from Florence and nearby towns. In the ensuing decades, Beth Israel continued to grow, peaking in the mid-1990s with 100 member-families. Losses in membership were balanced by gains from new arrivals. A healthy portion of families had young children, thus the Sunday school was a thriving operation. Following the renovation of the sanctuary in 1986, custom-made stained glass windows, designed by E. Crosby Willet of Philadelphia, were installed in the synagogue and doors of the ark. In 1973, the men’s club, which had formed in the late 1950s, merged with the Sisterhood. Both maintained their memberships with their respective national federations while working cooperatively to support Temple Beth Israel. The Affiliates, as the new group was called, was the only organization of its type in the country. In the 1980s and 90s, after Rabbi Folb’s departure, the congregation was able to maintain its religious leadership, hiring in succession Rabbis Sidney Strome, Lawrence N. Mahrer, and Marc Aaron Kline. Although Beth Israel was officially Reform, the traditions observed by members varied. For example, some chose to wear yarmulkes and tallisim. Certain members kept strictly kosher. While the congregation did not maintain a kosher kitchen, members refrained from bringing in foods such as pork and shrimp to temple functions. 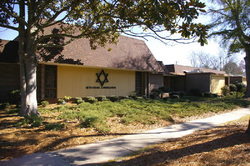 Beth Israel, which refers to itself as an “area synagogue” for the Pee Dee region, serves a number of small communities in the northeast section of the state. The Darlington and Dillon congregations, which had dwindled to a few members each, merged with Florence in the mid-1990s. Congregation Beth Israel’s Sunday school continues to thrive, and members are active in The Affiliates, the Youth Group, and adult education classes. Of the nearly 100 families, about half are mixed marriages. The face of the congregation has changed over the years. The children of the natives tend to move out of state to pursue their chosen careers, resulting in a decline in the number of families who are descendants of the founders. Countering this loss of natives is an influx of Northerners, often transitory, drawn by the local industries. Beth Israel appears to have retained its flexibility regarding tradition and practices. It serves as the center of Jewish life in the region.